Moncrieff recently assisted Bunnings with the replacement of Point of Sales (POS) and back office systems in 215 of its stores across Australia. The project required the replacement of approximately 3,800 desktop systems and the coordination and shipping of over 10,000 items, during a 6 month period. 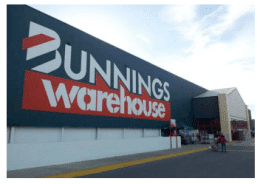 Bunnings needed to partner with an organisation with a demonstrated track record in providing the logistics and co-ordination for a project of this size. At the height of the project, Moncrieff held in excess of 2000 desktop systems and monitors. This was only possible due to the credit facilities available to Moncrieff. To support the project Moncrieff provided Bunnings with a consolidation service. This included the equipment purchased from Moncrieff in addition to other ancillary items such as Eftpos pin pads, pay pass modules, pin pad stands and other items sourced from multiple suppliers. These items were shipped to Moncrieff to be warehoused and managed as part of the rollout. The consolidation service required Moncrieff to pack all the items required for each store and ship them according to a schedule provided by Bunning. Bunnings required the replacement of 3800 point of sales and back office systems in 215 of its stores nationally. The schedule was hosted on a secure project management site on the Moncrieff web. The shared schedule provided both organisations with the ability to update details as required and was a central repository for information. It provided an overview of the progress and status of deliveries to Bunnings’ key project stakeholders. The service provided ensured that Bunnings assets and data was safe guarded, whilst also ensuring environmental standards were met. The project remained on schedule throughout with any potential issues raised early by the project coordinator at Moncrieff, Lars Engdahl. This enabled the schedule to be to be rearranged as required and kept the project rolling to ensure it was completed as scheduled. The success of this project is a testament to the processes and systems used by Moncrieff, but mostly to the skills, experience and dedication of the Moncrieff staff members involved. The initial planning, open communication and transparency between the Moncrieff and Bunnings teams assured that the project was not only a success but was also conducted in a positive spirit.